Learn how to make this classic cream dessert with Lactofree cream and lots of lime! Blitz the pecan nuts to a fine crumb in a food processor. Cut the vanilla pod in half length ways and scrape the seeds from the vanilla pod and add to the flour. Add the Maldon sea salt. Add the Lactofree spreadable making sure it is at fridge temperature and crumble using your fingertips until it resembles fine breadcrumbs. Make a well in the centre and incorporate the cold water. Grease the tart tin with Lactofree spreadable. 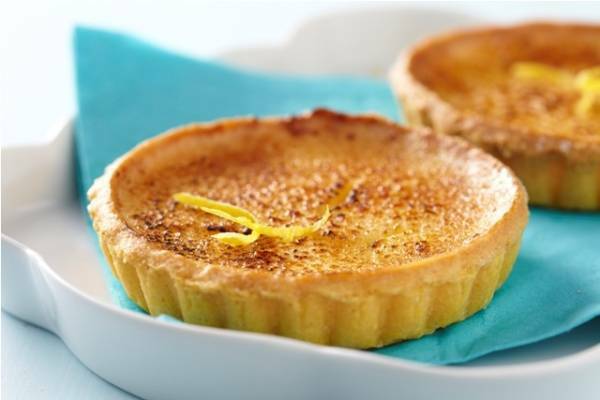 Take small pieces of the pastry and press it into the tart case until the tart case is lined with a thin layer of the pastry. Prick the base of the tart case lightly with a fork. Cut a circle of parchment paper large enough to cover the tart and place inside the tart. Fill with baking beans and then bake the tart case for 15 minutes. Remove the beans and return to the oven for a further 5 to 10 minutes. Allow to cool. To make the mixture, whisk together the whole eggs and the sugar. Add the zest and juice of all 4 limes and then mix in the Lactofree cream. Pour this mixture into your tart cases and cook in the oven for 25 minutes. The filling should wobble when you take it out. It will solidify further as it cools. Serve when cool with some whipped Lactofree cream.